Reflections on Teaching » Blog Archive » What’s a teacher to do? For those not wasting their hours of Spring Break on the Internets, the state of New York just took a torpedo to teacher permanency/tenure. Peter Greene has the most heartfelt post on how this went down, but it’s all over the place. Even though something like this is not in the current cards in my state (California), the deck can change. I subscribe to Mad Eye Moody’s philosophy of “constant vigilance” and believe in ongoing organizing. You can’t wait until the flood happens to prepare for the flood. For those in New York, New Jersey, and yes, California now is not the time to rely on this being taken care of by someone else. You are the one to get this done. Get informed, but get involved. Your union is the place to do it. But my union has this covered! Congratulations! I’m sure that many teachers wish they could say this about their local, but your local won’t stay that way if folks like you are on the sidelines. Many of our union leaders are some of our most senior teachers, and they will be retiring. 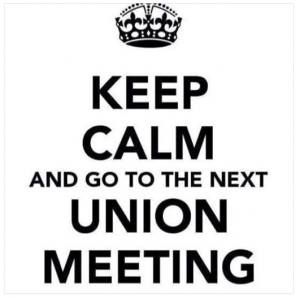 You are the union, that means stepping up. If not now, I can’t imagine when would be the “right” time. But my union is dysfunctional and doesn’t work. I’m sorry, I have definitely seen this union. You know how that changes? You and other functional adults join and change it from within. Unions are not a club (although some of them are run that way, I know) they really need all members working together to work well. You can have a part, whether they want you there or not. I don’t know, I just don’t feel comfortable with being so out there, so political. I’ll remind you all of that famous saying, you can ignore politics, that doesn’t mean the politicians will ignore you. I’m too busy with all the demands being put on me! This is perhaps the scariest tactic of reform. You keep the teachers running around responding to pointless demands, and who has time to organize? At a certain point you will need to invest at least a bit of extra time because NOTHING will change, and it will get worse, not better unless you make that change happen. If teachers at CAVA and other charter schools can take the time to organize, so can you!